This is a broad topic and is one that has perhaps not had the visibility it deserves in recent years. Recent contemporary operations in Iraq and Afghanistan have been conducted in environments where our adversaries, though lethal and innovative in some areas, lacked the technical sophistication to deny us the full spectrum access we need in order to successfully bring air power to bear. Put simply, modern air power is a high tech business and it is utterly reliant upon the ability to gain unrestricted and assured access to the entire electromagnetic spectrum, space, and, increasingly, cyberspace. Environmental degradations, be they imposed by an adversary or created by natural phenomena, have a massively debilitating effect on the ability to successfully project air power across all its roles. When I began my military flying career during the Cold War, NATO took its air power preparedness extremely seriously. We anticipated degraded operating environments, both in regard to electronic counter-measures and to the potential need to continue to operate in a nuclear, biological or chemical environment. We equipped our forces accordingly and trained for the worst case scenario. After years of coalition operations in uncontested (and uncongested) environments, we must now ask ourselves if NATO has taken its eye off the ball in this regard. In the pursuit of this question and in preparation for the upcoming ­Conference, the JAPCC offers the following food-for-thought pieces for your consideration. Designed to provoke thought and incite debate, the essays are written by leading thinkers from the military, industry, NGOs and academia and address various themes that should underpin any ­thorough discussion of preparing to operate in a degraded environment. 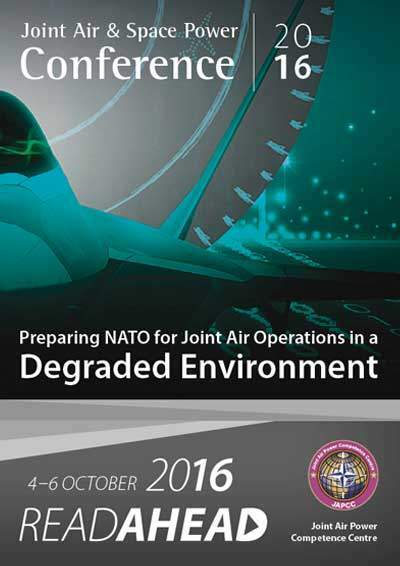 In seeking to address the constraints NATO’s air power assets might face in a degraded environment, the JAPCC staff has also assembled a multi-­disciplinary, multinational team of distinguished speakers and panellists for this year’s Conference. Crucially, the conference seeks to consider what NATO could and should do to improve its preparedness in this regard. This is your opportunity to contribute! I very much hope you will join us at Essen in October for what promises to be a fascinating and important two days. The essay displayed has been published as part of the JAPCC Joint Air and Space Power Conference 2016 Read Ahead. You can download the full Read Ahead book by clicking the image below. Are We as an Alliance Prepared to Operate in a Degraded Environment? Lawfare: Lowering Legal Thresholds Because of a Degraded Environment?